Whether 2017 has been a huge success or more of a disappointment for your business, it’s time to start looking for ways to improve in 2018. With customer service and communication becoming an increasingly important component of success for all businesses, your phone system is a great place to focus. Even small upgrades here can pay big dividends. 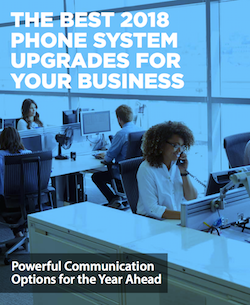 To help you plan for next year, we’ve put together this guide on The Best Phone System Upgrades for Your Business in 2018.